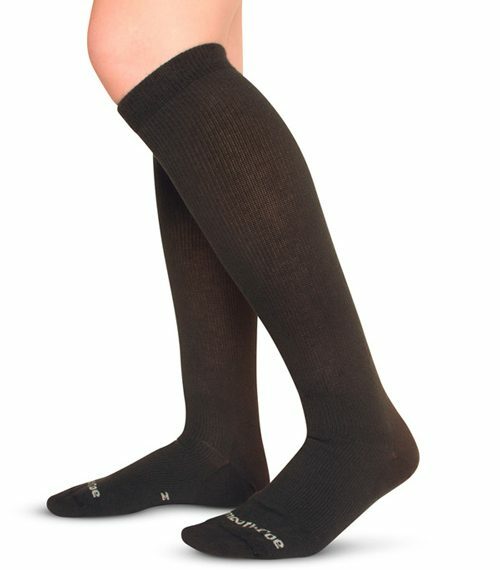 Graduated compression socks are a non-invasive, simple, and relatively affordable form of therapy for venous conditions affecting the legs and feet. These conditions range from chronic venous insufficiency (SVI), circulation problems caused by diabetes, painful swelling and edema, varicose veins, and more. How do graduated compression socks work? Graduated compression socks assist in circulating blood upwards, back to the heart. They place a non-constricting pressure on the veins in the lower limbs, which alleviates stretched vein walls and pooled blood. In a sense, they work as a contracting muscle, similar to the way in which the calf muscles are engaged when a person walks. Therefore, their pressure is greatest near the ankle, and gradually eases as it goes higher up. Where do I get compression socks? Although a doctor doesn’t have to decide if graduated, or medical-grade, compression socks are right for you. In order for graduated compression socks to be safe and effective, they should either be prescribed or chosen with careful attention with regard to the appropriate pressure grade, measured in mm Hg, or millimeters of mercury. Next, it is important to consider the proper fit. A custom fitter, a doctor, or an online sizing chart can help you find the right fit. Graduated compression socks have come a long way in style. They can be found in different colors and styles, and for both men and women. Compression socks work best when they are worn all day, every day. Wearing compression socks may take some getting used to, and it’s ok to start with wearing them as long as you can while gradually increasing the time you wear them each day. Remember, in order for graduated compression socks to work safely and effectively, they must be the proper fit. Never cut them, allow them to contain wrinkles, or fold them down to wear them. Follow all washing instructions carefully, and measure your fit again in the event of major weight changes. SMOOTHTOE specializes in American-made graduated compression socks, developed by Lifestyle Medical Group, LLC. Our innovative compression socks were designed to be easy to put on, comfortable, and athletic in appearance. Visit our the other sections on our website to learn more and shop for socks online–or call us at (507) 725-8883!